I got a little bit grumpy when I saw an article in the Sunday Times magazine recently advocating getting active and starting going to the gym, running or other sports, with a ‘Get the kit’ guide to buying sportswear that didn’t contain a single item under £100. Apparently if you fancy starting running you need a Stella McCartney for Adidas Running Jacket that’ll set you back £270. Not true! The thing I love about running is that it barely costs a thing – bar a good pair of trainers and a sports bra – no expensive gym membership, no equipment or kit to buy, and better still you can do it at the crack of dawn or before bed when you don’t have to worry about what you look like – no turning up at classes and feeling self-conscious that you haven’t got the latest gym shoes or yoga mat. In fact the beauty of fitness at all is that everyone gets sweaty and has to slug it make-up-less, looking their worst. If you’re not sweating buckets you’re not trying hard enough. It almost feels contradictory then, that I’m about to tell you the pretty sportswear bits I’ve been eyeing up – surely if it’s not a fashion show then it doesn’t matter what you wear? I agree, but I’ve found recently that a new, brightly coloured, garishly printed pair of shorts, brightly coloured trainers or vest can mean I feel even more motivated to throw it on and get out there. You see, fitness is for me, and if I want to do it wearing galaxy-print leggings, well then I think that’s okay. I follow lots of fitness types on instagram and they do rather seem to make workouts look, well, a bit bloody cool. So now I’m working even harder so that I have the sort of body that can accomodate some teeny Nike shorts and still look bangin’. I’m sorry if that sounds superficial but it gets me out of bed and out the front door at 6.30 so it’s good enough for me. 1. Nike Air Pegasus+ 30, £85 – These are pretty and practical – as well as the fact that I adore the colour and style I’ve also heard good things from runners about these trainers (and they’ve been voted Best Buy by Runners World this month). 2. Nike Run The Earth sweatshirt, £45 – I’m not sure I’d wear this for working out but if I did it looks baggy and comfy enough for daywear and runs when the temperature starts to drop. 3. Sweaty Betty ‘Zero Gravity’ Run Tights, £85 – I am a huge Sweaty Betty fan – their workout wear is just sublime and they have pretty and practical down to a T. I just adore the print on these, and the reflective seams and key pocket mean they’d be perfect for morning A/W runs. 4. Lovely Sally printed leggings, €45 – I spotted a fitness YouTuber wearing some Lovely Sally leggings – they are lycra so I think even though they’re not designed for fitness they’d be fine for running in. This print is just uh-mazing – I’ve designed myself a rewards chart for when I lose certain amounts of weight and I only need to lose a few lbs to allow myself to buy these treats. You won’t be able to stop me from going running when I have these in my gym bag! 5. Nike Pro Essential shorts, £20 – These are also on my rewards chart, except for way down the chart so I actually have a bum I can fit in them! These are what all the fitness instagrammers wear and I would love to feel comfortable running in something like this – even worn underneath some bigger shorts they just look so comfy and supportive! 6. Shock Absorber Zipped Sports Bra, £25 – At the moment as well as running I go to my local gym, do some time in the gym and then get changed into my bikini and go for a swim. I can tell you that after 45 minutes in the gym, having a fight with a sweaty sports bra is not top of the wants list for my tired arms, so I love the idea of this zipped bra. I need to go for a fitting before I buy another sports bra though, I realised I haven’t had a fitting for a couple of years and I’ve lost 18 lbs since then so I’m sure my measurements will have changed. The Figleaves Online Fitting Room has just recommended that I go down a size, I think it might be right! Are you eyeing up any sportswear at the moment? 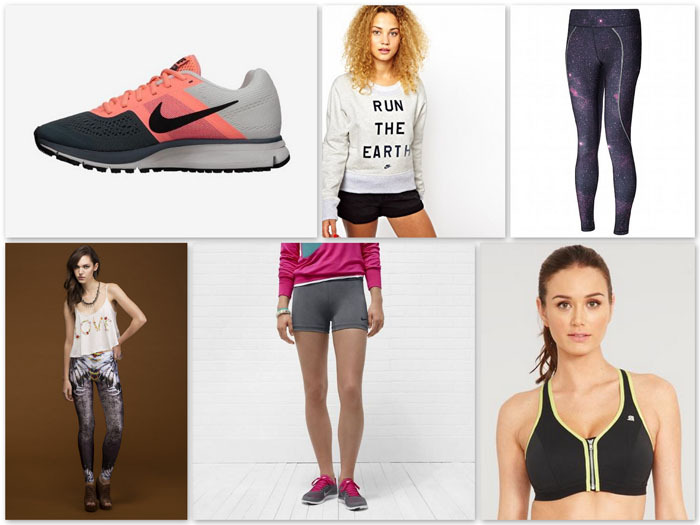 Do you just buy the basics or do you like to splash out on gym clothes?